Projecting future physician workforce needs is a challenging calculation that must take multiple variables into account to avoid missing its mark. In the mid-1990s, the American Medical Association confidently predicted that the penetration of managed care would lead to a large "physician surplus" and convinced Congress to cap the number of graduate medical education (GME) positions subsidized by the Medicare program. Two decades later, there is a widespread consensus that the U.S. is actually experiencing a physician shortage that will worsen with population growth, the aging of the baby boomer generation, and an influx of newly insured from the Affordable Care Act. Although medical schools have expanded to meet the anticipated demand for doctors, the AMA and others are still pushing for the GME cap to be lifted so that new medical graduates will have enough places to train. But how has the specialty of family medicine fared, and what else can be done to extend capacity of the existing primary care workforce? These questions were the subjects of two recent Georgetown University Health Policy seminars. 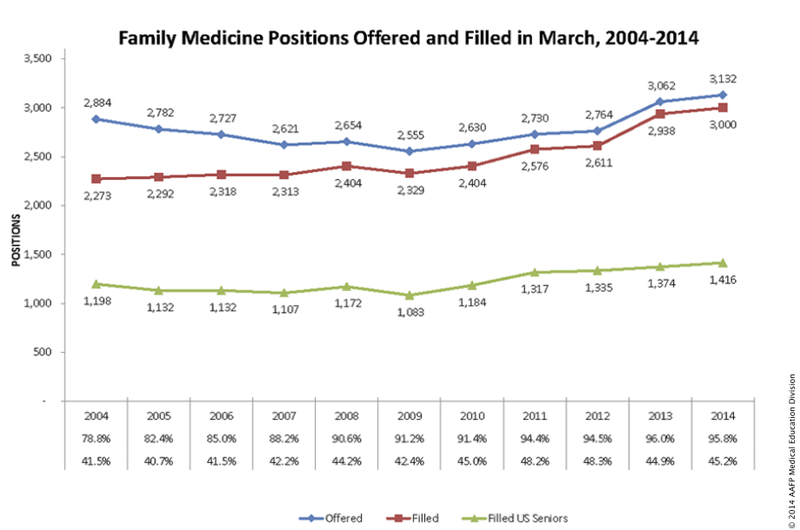 Modest gains in the numbers of U.S. and foreign medical graduates matching into family medicine residency programs over the past five years will fall well short of supplying an additional 52,000 primary care physicians by 2025, a shortage projected by the Robert Graham Center. A recent issue of Health Affairs examined potential strategies to extend primary care capacity in the absence of an (increasingly unlikely) surge in generalist trainees. For example, telehealth technologies could lighten the load on family physicians by promoting patient self-management of chronic conditions; improving medication adherence; and facilitating real-time specialist consultations. A more radical and controversial proposal aims to provide EMT-style training to a new profession of "primary care technicians" who could provide basic primary care services under the supervision of a physician, freeing physicians to "focus on patients with more complex conditions." As our discussion pointed out, though, these proposals have serious disadvantages. By reducing face-to-face interactions, telehealth could easily make family medicine less rewarding. Family physicians who end up seeing only patients with multiple complicated chronic conditions could burn out faster, leaving even fewer in the workforce. As a broad cognitive rather than a narrow, procedure-focused specialty, family medicine is less likely to be suited to care by technicians than, say, anesthesiology or gastroenterology. Finally, given the persistent and growing income gap between family physicians and subspecialists, the real solution to the primary care shortage may still be staring us in the face. It's sometimes easier for a patient with musculoskeletal low back pain to get an appointment with a spine surgeon or for a patient with panic attacks see a cardiologist than it is to find a family physician. You can get a same-day MRI for any number of problems that probably don't require any imaging at all. ... To improve population health in the U.S., we need to flip the pyramid so that primary care services are the base for all other health care structures. The ultimate success or failure of the campaign will depend on how well physician societies can convince their members to curtail commonly accepted but nonbeneficial services, such as the annual physical examination in healthy adults. I am not nostalgic about trying repeatedly to place an 18-gauge IV in a patient with no palpable veins at four in the morning, or replacing a delirious patient's nasogastric tube for the fifth time in as many hours because he kept pulling it out. But at least that kind of scut, unlike the tedious tasks involved in electronic documentation, was work that was meaningful to patients. The cover article of American Family Physician's March 15th issue, "Common Questions About Clostridium Difficile Infection," reviews truths about a disease that is a direct consequence of medicine's good intentions: antibiotic use, both appropriate and inappropriate. A recent Vital Signs report from the Centers for Disease Control and Prevention (CDC) addressed the magnitude of the latter by demonstrating that broad-spectrum antibiotics are up to three times as likely to be used in some hospitals compared to others. Additional analyses concluded that 37 percent of prescriptions for intravenous vancomycin and antibiotics for urinary tract infections were not supported by diagnostic testing or documentation of symptoms. The CDC estimated that reducing the use of broad-spectrum antibiotics by 30 percent could eliminate more than 1 in 4 Clostridium difficile infections. CDC Director Thomas Frieden, MD, MPH outlines seven steps for hospitals to improve accountability and monitoring of antibiotic prescribing in the video below. Increasingly, Clostridium difficile infections are occurring in outpatient as well as inpatient settings. A study published in Pediatrics revealed that 71% of laboratory-confirmed Clostridium difficile infections identified by a U.S. population-based surveillance system from 2010 to 2011 were community-acquired, with the highest incidence among children 3 years of age or younger. According to the review article by Dr. Bradford Winslow and colleagues, many Clostridium difficile infections can be prevented by minimizing the frequency and duration of antibiotic prescriptions; practicing hand hygiene and adhering to contact precautions; and prescribing probiotics to patients who are taking antibiotics for infections. Many of the best-read posts on Common Sense Family Doctor have voiced my strong opinions regarding guidelines. After I left my position as a staffer for the U.S. Preventive Services Task Force in November 2010, it was three years before I was tapped for another guideline post, this time at the American Academy of Family Physicians. Recently I joined the AAFP's Commission on Health of the Public and Science, which formulates guidance for family physicians on a variety of topics, including clinical preventive services. My appointment coincided with the release of two high-profile guidelines on high blood pressure and cholesterol. For most of my career in family medicine, nearly all physicians followed the same guidelines to manage these common risk factors for cardiovascular disease: JNC 7 and ATP 3, expert panels convened by the U.S. National Heart, Lung, and Blood Institute. After the JNC 7 blood pressure guideline was published in 2003, waiting for the release of the next iterations of these guidelines was like waiting for Godot. Then, in an abrupt move that was seen by some as wanting to avoid a public uproar similar to that caused by the 2009 USPSTF guideline on mammography, the NHLBI announced last year that it would no longer sponsor guideline development, and instead leave the process of translating evidence into recommendations to professional medical societies. The result has been a fracturing of the longstanding primary care and subspecialist consensus on what to do for patients with high blood pressure and cholesterol. The new cholesterol guideline, published under the auspices of the American College of Cardiology and American Heart Association, quickly came under fire for recommending that clinicians base treatment decisions on a relatively untested cardiovascular risk calculator that could lead to a surge in statin prescriptions for older adults with normal cholesterol levels. In contrast, the hypertension panel elected to skip organizational endorsement and publish their guideline directly in JAMA. "JNC 8" endorsed looser blood pressure targets for older adults and rejected stricter targets for adults with diabetes and chronic kidney disease. Dissension within the panel became public when five members published a "minority report" that argued against abandoning the goal of a systolic blood pressure under 140 in older adults. As of this writing, it's not clear which medical groups will endorse or reject the new guidelines. There has been much hand-wringing about the potential negative impact of conflicting guidelines. Whose guideline should doctors follow? How do we explain to our patients why guideline recommendations differ? When I worked for the federal government, these kinds of concerns engendered not-so-subtle pressure to "harmonize" or "align" existing discrepancies between official guidelines, such as those on screening for HIV and hepatitis B and C. Now, the USPSTF and the Centers for Disease Control and Prevention concur on whom to screen for these infections, but to align their new recommendations, the Task Force arguably lowered its evidence bar and drew conclusions from a weak literature base. The same thing seems to have happened in lung cancer screening, where USPSTF recommendations for annual CT scans in heavy smokers harmonized with guidelines from oncology, radiology and pulmonology groups but were later rejected for "insufficient evidence" by the AAFP (note: though I agree with this call, I was not involved in the AAFP's decision process). Sure, it's easier for everyone when guidelines agree on what to recommend for a particular patient in a particular situation. But when “reaching alignment" is simply a euphemism for one guideline group exerting political pressure on others to fall into line, that isn't good for medicine or for patients. After all, it wasn't so long ago when medical groups marched in virtual lock-step to recommend menopausal hormone therapy to reduce the risk of heart attacks and strokes, and to lower blood glucose levels as close to "normal" as possible in patients with type 2 diabetes. Both of these recommendations now appear to have done much more harm than good. Patients' interests would have been better served if at least one guideline group had had the courage to jump off the bandwagon. If the ubiquitous television advertisements are to be believed, there is an epidemic of low testosterone (or “low T” for short) sweeping America. Men of all ages have been instructed in these advertisements to “ask their doctor” if they have any one of a list of nonspecific symptoms that could be improved with testosterone therapy. Although hypogonadism is the only widely recognized indication for testosterone supplementation, recent research suggests that substantial numbers of men without testosterone deficiency are receiving prescriptions. Concerns about excessive testosterone therapy led the Endocrine Society and the American Urological Association to recommend in the Choosing Wisely campaign that clinicians not prescribe it to men without biochemical evidence of testosterone deficiency, including men with erectile dysfunction and normal testosterone levels. In addition to having questionable benefits for these patients, supplementation is potentially harmful. Recent studies have linked testosterone therapy to an increased risk of cardiovascular events in men over age 65 and in younger men with heart disease. The Endocrine Society recently recommended that physicians talk with patients about these potential risks and avoid prescribing testosterone to men without hypogonadism. In the meantime, the U.S. Food and Drug Administration is re-evaluating the risk of stroke, heart attack, and death associated with testosterone products. Given well-documented efforts of pharmaceutical companies to expand the market for testosterone therapy by ghostwriting articles for lay and scientific publications, physicians would be wise to steer clear of commercially-sponsored educational offerings and restrict prescriptions of testosterone to patients with FDA-approved indications. This post first appeared on Common Sense Family Doctor on November 18, 2011.